There are no membership requirements other than an interest in the tenants at 221B Baker Street. There are no membership dues other than postage costs if you want meeting notices mailed to you. Most people get this information via e-mail or at this website. Dinner meetings are held quarterly. Each meeting notice lists the agenda. Drinks and dinner at our meetings are Dutch treat. There are no business meetings, no board of directors, no treasury. There were four founding officers, but three of them have died and one has vanished. No replacements have been named. There are numerous committees, such as the Committee on Quizzes, the Committee on Victuals and the Committee on Commercials. However, these committees never meet and their membership is unknown. Members are often found at other Sherlockian goings-on, such as plays, films, talks, and gatherings of mystery lovers. The Committee on Things Like That keeps members up-to-date on these opportunities via this website and announcements at meetings. Many members participate in a number of Sherlockian groups. Monica Schmidt, ASH, is the president of The Younger Stamfords of Iowa City. She is a member of multiple Sherlockian scions and societies in the Midwest, including The Hounds of the Baskerville (sic) and The Norwegian Explorers. Monica was introduced to Holmes through a children's edition of The Mysteries of Sherlock Holmes and the 1987 TV movie The Return of Sherlock Holmes. When not engaging in Sherlockian events or attending film festivals, Monica works as a licensed mental health counselor specializing in the treatment of substance abuse and is a member of the film critic staff for Cedar Rapids radio station KCCK. Many Sherlockians have a passion for collecting all things relating to Sherlock Holmes: books, movies, games, dolls, and even chocolates. But there is a point when collecting crosses the line and becomes something unhealthy: hoarding. In her presentaion Monica will explore the pathology of hoarding with a focus on Sherlockian collecting. 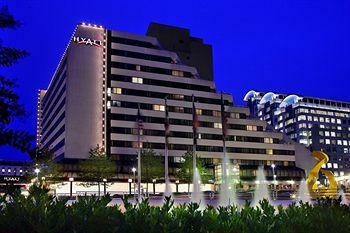 The Hyatt is located at 7400 Wisconsin Avenue in Bethesda, where Wisconsin crosses Old Georgetown Road / East-West Highway. It is directly above the Bethesda Metro station. For those who come by car, convenient parking is available at the Bethesda Center Garage, at the northeast corner of Edgemoor Lane and Woodmont Avenue, with garage entrances from both streets. Parking is only $1.25 per hour, but be sure not to park in a three-hour-only space. Take the elevator to the Skywalk, which connects to the hotel. See the event schedule in the lobby for the name of the meeting room and proceed thither. Lunch will cost $42.00, including tax and tip, and as always, payment in advance is neither required nor requested. Since the meal will be served buffet style, there is no need to make advance menu selections, but reservations need to be made by September 5 (see below).